vaugc002, Antinos and Matt N like this. Although short, I love the string of elements. It'll certainly be a thrilling ride - exciting enough to warrant a trip there next year. 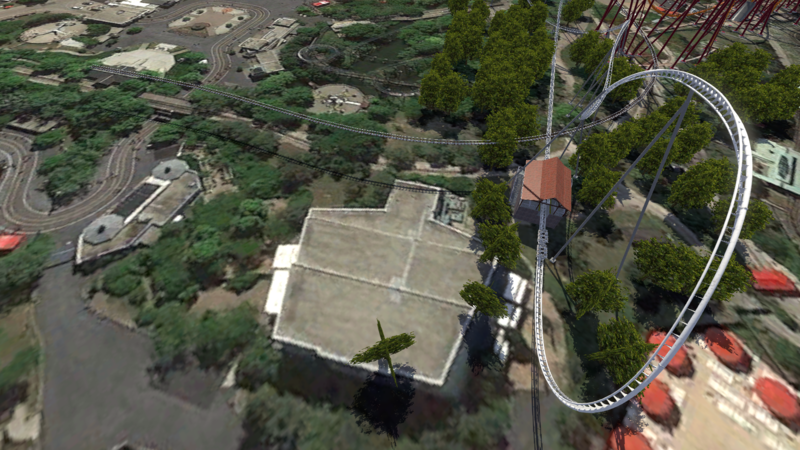 What bothers me about the ride is the Full-Throttle-esque brake run. The park tore down a theater and is somehow using ALL of the space for this ride? Please...c'mon, Six Flags. They're already spending how many million on this? They might as well spend an extra million or two to drop that dive loop next to the station, add a swooping turn, and a proper brake run, transfer track, and storage shed. Whether this ride underwent major budget cuts or was just lazily designed, the execution of the ending is not good. Yes, I think this is what was at the back of my mind too. Ten years ago the stat of 175ft high would have meant a coaster of probably 4,000 - 5,000 ft.
Obviously we're talking different kettle of fish, but I find larger investments disappointing when they're as fast as this but get cut short. The park tore down a theater and is somehow using ALL of the space for this ride? Best part is that the ride is using little to none of the actual space the theater took up. Credit to Airboss on Discord. To be fair, the theater sat on a rather large hill, so it doesn't surprise me that they wouldn't want to deal with the landscaping any more than they already have to. Hixee, Antinos and EthanCoaster like this. That means they still have space for Harley Joker's Crazani-Spin, their newest 170 foot pendulum ride. J Rod, Snoo, Jaiden M. and 5 others like this. No offense Cam, just thought I was done with it after the past 12 months. Nope, back to Gurnee with you. Off you pop. Think of it as going back to visit Hooters (much more justifiable ) and picking up a bonus +1 while you're there. I'm happy to give this a miss for a few years. I don't want to go back to that park any time soon. Lofty and Howie like this. What's with all the not wanting to go back to SFGAm, out of interest? If I was given the opportunity to board a plane to visit any Six Flags park, I'd take it in a heartbeat! CoasterMac305, Matt N and Snoo like this. Jaiden M., gopats1479, EthanCoaster and 6 others like this. The one in Ohio is a bit of a secret as well. Not listed on any map and the website is down. I can assure you it's there tho. Ah, the amazing Six Flags Worlds of Adventure. I heard it became the biggest park in the world around the turn of the millennium. Given how well the theme park industry has fared since then, the park surely must be worth a visit today. Peet, Coaster Hipster, EthanCoaster and 3 others like this. I heard another park was seeing signs around the turn of the millennium. SFWoA must've been overshadowed after that. Maybe that's why it's a bit of a secret! Since it's really the only amusement park that serves the entirety of Chicagoland and the surrounding region, it's chronically packed beyond all belief. I've been thrice and it has been packed every time, including weekdays. The operations are dire and the staff are clueless and, in some cases, rude. It's a shame since they've been finally getting some solid investments recently. Ah right. Thanks @Antinos and everyone else! Out of interest, for those who have been to both, are Six Flags parks anything like Thorpe Park?